Worldwide, breast cancer is not only the most commonly diagnosed cancer in women but it remains the most lethal of all cancers. 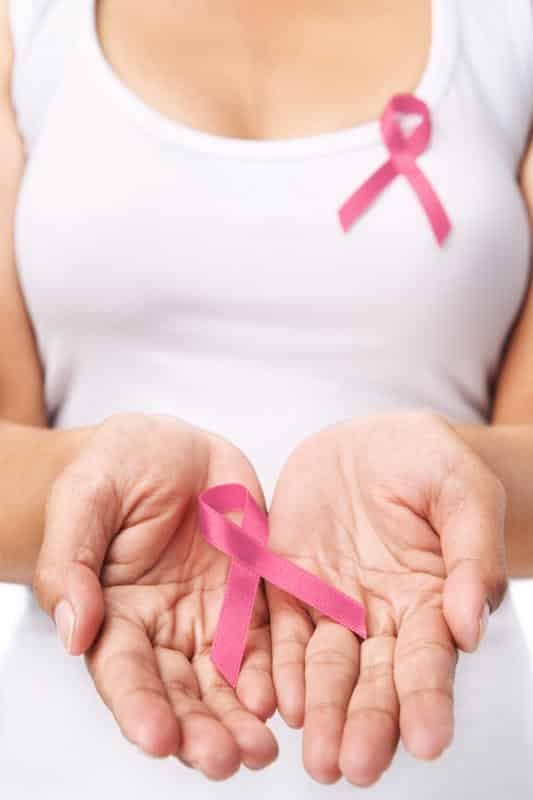 The American Cancer Society’s (ACS) predicts that in 2013 approximately 232,340 women will be newly diagnosed with invasive breast cancer in the USA. Of these new cases, 64,640 will be carcinoma in situ (CIS). The America Cancer Society goes on further with the morbid prediction that 39,620 women will die from breast cancer this year. There are two types of CIS, ductal carcinoma in situ and lobar carcinoma in situ (DCIS & LCIS), neither of which are cancer. LCIS is, for the most part, spared from the deadly net of medical myths, which round up vulnerable people fearful of losing their lives. 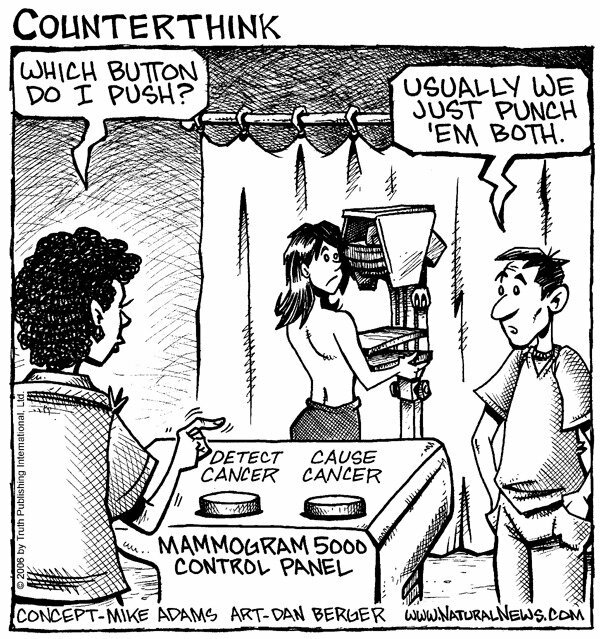 Furthermore, few patients with DCIS ever actually die as a result of breast cancer. A population-based study that was published in the Archive of Internal Medicine in 2000 showed that only 1.9% of patients with DCIS eventually died from breast cancer within 10 years of their DCIS diagnosis. That is quite noteworthy since “cure” is usually defined by conventional medicine as surviving for 5 years after initial diagnosis. Hence, according to those criteria, which are the same used to test chemotherapeutic drugs, there is a 98.1% remission rate for DCIS. Despite the relatively benign nature of DCIS, patients with this diagnosis are routinely subjected to the same aggressive medical “care” that is considered standard-of-care (‘scare’) for invasive breast cancer. This leads to an alarming concern with regards to over-diagnosis and, hence over-treatment. 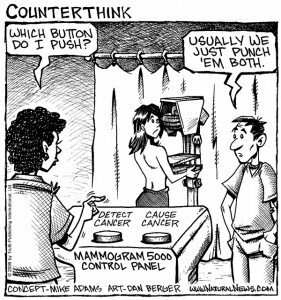 The rate at which breast cancer is over-diagnosed using mammograms for screening has been estimated at between 5% and 50%. Approximately 40,000 women in the USA are most likely being treated unnecessarily EVERY YEAR with chemotherapy, radiation and disfiguring/debilitating surgery. Before the advent of mammography, DCIS did not exist, while it now accounts for approximately 50% of all breast cancer diagnoses. When the mortality rates associated with these practices of treating DCIS similarly to invasive breast cancer are considered, alarms should go off leading one consider using other, non-conventional breast cancer screening methods such as a combination of ultrasound and thermography. 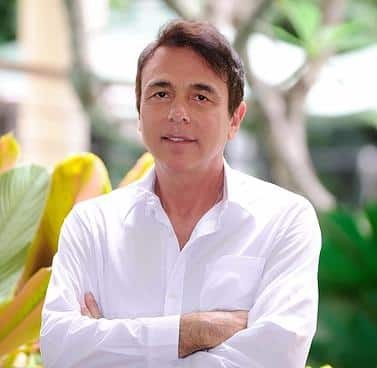 Dr. Eric Wiener, Chief of Breast Oncology at Dana-Farber Cancer Institute in Boston was quoted as saying, “doctors should make it clear that DCIS is not cancer; it is only a possible pre-cancer”. Mammograms rely on the identification of small (microscopic) areas of calcifications in order to diagnose CIS; ductal carcinoma in situ (DCIS) and lobular carcinoma in situ (LCIS). This is a serious error based upon a complete ignorance of human physiology and pathology. When cells or tissues become acidic from low oxygen or accumulated toxins preventing healthy aerobic respiration, the body has many buffering systems which are called into play and when all else fails, calcium is recruited out of the bones because of its’ great capacity to neutralize acids. Hence, calcium begins to accumulate….it is the first sign of the body’s homeostatic (balancing) dance, NOT CANCER! Calcifications in the breast or any tissue or organ in the body are evidence of an acidic metabolism and that some immediate lifestyle changes are required to restore a healthful balance, which will preclude major homeostatic balancing processes by the body and a compromised longevity. In other words, cleansing and purifying are what is necessary to allow for restoration of health, not a toxic assault.